I talk an awful lot about how much I've decluttered and how much I love my fresh, open spaces. And everyone knows how much I love decluttering and organizing, both my own home and other people's space. But I don't often talk about all the reasons why. Because there's a lot. 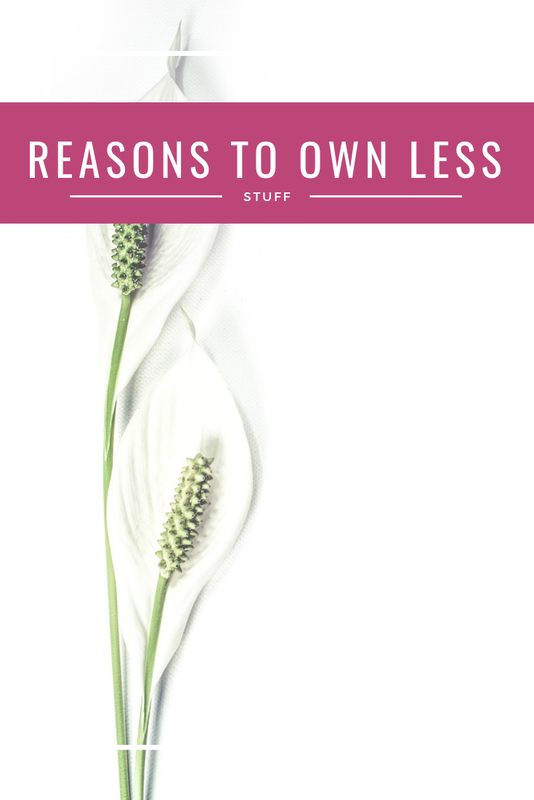 So many reasons why you should own less. Even if you're not a minimalist in the typical sense of the word, you can still benefit from less. Easy Cleaning. This is the most obvious reason for me, and one of my favorites. While I love organizing, and I love having a clean space, I definitely do not love the process of cleaning. There's a ranking of cleaning tasks that I hate more than others, but I don't actually like any of them. So I want my space to stay as clean as possible so I don't have to be washing things down every day. It's also easier and faster to get the process done when you do clean. There's nothing all over the floor that needs to be picked up before you can mop, there's no knick knacks to constantly dust and move around to clean the shelves, even the kitchen counters can be quickly wiped off since I'm not moving all sorts of mugs or appliances to do so. Every single cleaning task takes less time when I don't have to tidy anything before getting to the deep cleaning job. Money Saving. Being a minimalist is an obvious way to save money - if you don't own things, you don't buy things and you don't spend your money. Minimalists buy quantity over quality too, because they can save up while they aren't wasting money on small, insignificant things, so while it may seem like that $200 blender is a lot of money at once, it's actually a great savings deal in the long run because it lasts forever and there's no need to buy a $40 blender every year at Target. There's also savings to be found in the cost of storing and maintaining items. If you don't own them, you can live smaller. And you don't need to spend a lot to insure your items that way, either. My personal favorite money saving reason to own less - you don't waste money on duplicates because you never lose anything. When you have so few items, nothing is lost in the shuffle, and you don't have 47 back up toothpaste tubes because you couldn't find the ones you bought the last time. I save so much money by not owning a lot of stuff. More Free Time. Experts believe that people spend the equivalent of 2.5 days each year just searching for things they lost in their home, like keys and shoes. I can think of a lot more things I would like to do with 2.5 days in my year than look for my keys. If you have so much space and so many things filling it that you often lose things you need and use, you have too much stuff (and it's definitely too disorganized.) I never look for anything. I have places for everything but even if I didn't, there's just nowhere for small items to hide. I could find anything in 30 seconds. But even beyond lost stuff, you gain a lot of time back by not owning much. There's less cleaning and caring for items, of course, but there's also less time spent shopping. And you can work less because you don't need as much money to live on if you're not wasting it on stuff. Time is one of our very finite resources, and it's so important to determine how you want to spend yours. Mental Clarity. Let me tell you about all the things you no longer have to think about when you have less stuff: where to buy it, how much to spend, where to store it, how to clean it, how to use it, how to display it, how to move it, how to insure it, how to repair it, whether or not it's currently lost, whether you have to put it away before guests arrive, and on, and on. Many times we just focus on a single aspect when purchasing an item - the price on the sticker. But the actual price is much higher when you start to consider just how much mental energy you're exerting in the long run on having that item. And then multiply that by the number of items you have in the house - it's totally overwhelming. Consider all that saved brain space and power when you're not thinking about your stuff! You can think about things that are important to you. Peace of Mind. There is so much less stress involved with having less stuff. Mess and clutter causes mental stress. It's like living in a constant state of chaos. When your space is clean and uncluttered, your brain can finally relax. You get so much peace of mind from being able to relax in your own home when it's suddenly a haven and not a place where you have piles of clutter in every corner begging for your attention. You also get peace of mind from not having to worry about all your possessions when you're away from home. 'Things' stop being so important to you, and your focus is shifted to people, animals, causes, anything other than 'stuff.' There's no pile of things I need to grab in an emergency. Just Hawkeye (though she'd argue for her water bed to come too.) And a side benefit that I really love? I never stress over whether my home is clean enough for guests. It's always in great shape! Ultimately, I love the freedom that having less stuff has given me, in all these ways and more. Which reason sounds the best to you?